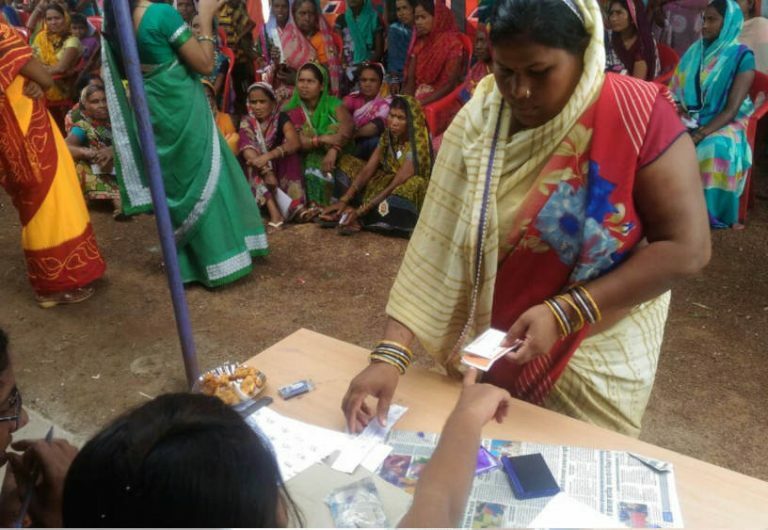 A beneficiary of the Sanchaar Kranti Yojana receives a token from a government official before she heads in to collect her smartphone in Ringni village in Chhattisgarh’s Durg district at a phone distribution event on September 6, 2018. To empower women and boost ownership of smartphones, Chhattisgarh is distributing free smartphones: 4 million to rural women, 500,000 to urban women and 500,000 to college students. This scene was not unique to one village. All across Chhattisgarh through September 2018, the state government was giving a smartphone to one woman in each rural household. The programme, entitled Sanchaar Kranti Yojana (SKY), or the Telecommunications Revolution Scheme, covered 2.3 million rural women by the end of September. As if that weren’t ambitious enough, SKY also gave smartphones to 300,000 college students and 350,000 urban women--and will increase network coverage by building just under 1,500 towers, thus encouraging even more phone use and ownership beyond the beneficiary pool. The main purpose behind programme SKY is to address low phone ownership in Chhattisgarh and to empower women in the process. As evident from the heat maps below, Chhattisgarh has India’s fourth lowest mobile phone ownership rate--45.6%--which is five percentage points lower than the overall average. At the same time, Chhattisgarh’s gender gap in phone ownership is the lowest in India at 14.3 percentage points: 52% of men own a phone compared to 38% of women. At 32.7 percentage points, India’s overall average gap is more than twice that amount. Yet a relatively smaller gender gap in ownership does not necessarily mean the gap won't grow over time--many states with higher male phone ownership also have larger gender gaps. The potential impacts of SKY go beyond female mobile engagement. Ample research already shows that mobile phones encourage economic development. Phones help producers and consumers access the best price for market goods and learn about job opportunities. In Kenya, mobile money has reduced households' vulnerability to economic shocks. “Behavioral messaging” through SMS and voice calls have improved behavior in domains like finance, health, and education. A few studies highlight the value of women’s mobile phone access, both for themselves and others. One study found that M-PESA, Kenya’s mobile money platform, has lifted 2% of Kenyan households out of poverty. Increases in consumption were concentrated among female-headed households, suggesting that women had more to gain from mobile money. A study from Niger found that when women took cash transfers through mobile money application rather than as cash, household dietary diversity improved, a result attributed to women’s increased bargaining power within the household. Similarly, we might expect women to use their SKY phones to improve their children’s lives in some way. While empowering women with technology is a noble pursuit in its own right, this further highlights the value of SKY targeting female beneficiaries rather than male. The success of SKY’s targeting of female beneficiaries comes with a caveat: Transfers are only as effective insofar as the beneficiary perceives them as useful and relevant. Recent experience with the Pradhan Mantri Jan Dhan Yojana (PMJDY), or Prime Minister’s People’s Wealth Scheme, illustrates this.